Olaus Magnus's work on the Nordic people was published in Rome, in 1555, and written in Latin under the title, Historia de Gentibus Septentrionalibus. The account of the septentrionale people (the people below the Big Dipper, or the Plough) was the first report in Latin that thoroughly described the Nordic countries to a geographically interested Renaissance Europe. Until the advent of this era, the northern regions were basically regarded as a "terra incognita." This work was based upon a journey that Olaus Magnus took to Norrland in 1518-19. He visited Nidaros (Trondheim), and travelled as far north as Pello, in Övertorneå. Torneå is described as a meeting place for the people of northern Scandinavia. His portrayal is based upon three "truths": the Nordic countries are said to be the cradle of warfare, the haunt of demons, and the realm of cold. The author writes about the rich catches of fish off the coast of northern Norway, Lofoten's engulfing maelstrom, the invincible Vardø fortress, the lifestyle of northern Scandinavia's Sami, and of sea monsters that tear human beings apart with their horrible teeth. Polar people, according to our sources, use nature to their advantage in warfare. In a warning directed to foreign powers not to intervene in the affairs of the northerners, Olaus Magnus writes that ice, snow and the cold have produced a hardy people whom are distinguished by their courage, strength and bravery. This work was made up of 22 parts that altogether comprise nearly 770 chapters. Readers will find approximately 500 illustrations here - many of them made by Olaus Magnus himself. And the more than eight-hundred pages of the original Latin edition were actually written as a detailed commentary to Carta Marina, a 1539 map which Olaus Magnus had made and published in Venice. 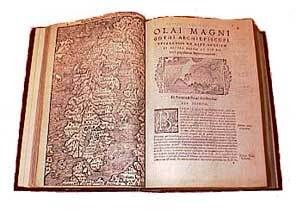 The book was translated into French, Italian, Spanish, German, Dutch and English during the 16th- and 17th-centuries. The Swedish translation first appeared in the 1920s. Nonetheless, only the Latin first-edition and the Swedish translation were complete until the publication of a three-volume English edition in the spring of 1999. Olaus Magnus was a Catholic and lived in voluntary exile following 1524. From 1544 onwards, he performed the duties of a titular Swedish bishop.